Peter Sagan rocketed ahead of Liquigas team-mate Vincenzo Nibali and the select group that arrived in Chieti’s centre to win Tirreno-Adriatico stage four on Saturday. Nibali placed third, passed by Roman Kreuziger (Astana). Di Luca (Acqua & Sapone) took fourth in his home Abruzzo region ahead of Chris Horner (RadioShack-Nissan), who is the new race leader. USA’s Horner leads Kreuziger by seven seconds in the overall classification. Cameron Meyer (GreenEdge) is in third at 13 seconds and Sagan fourth at 21 seconds. 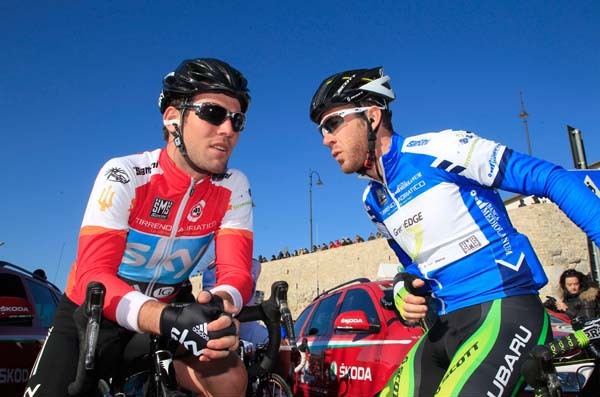 Sky won the last two days, but today Liquigas led out for Sagan and Nibali. The stage covered 252 kilometres to reach Chieti, made easier without the Lanciano Pass. Yesterday, the organiser decided to take a detour due to bad weather on the pass. Liquigas helped keep a seven-man escape group in check. At one point, the group gained 11-50 minutes, but with 11.4 kilometres remaining, the last man, Pavel Brutt, was finished off. Without Lanciano, the major difficulty was the distance, at seven and a half hours, and the numerous lower category climbs. The rise to Chieti, where Michele Scarponi won in the last two editions, provided the final punch. From two to one kilometre to go, the road ramped and touched 19 percent. BMC Racing led Philippe Gilbert to it with Alessandro Ballan, George Hincapie and Cadel Evans – and all-start team. Johnny Hoogerland dashed Gilbert’s hopes with an attack. His move brought out the winning five: Sagan, Nibali, Horner, Kreuziger and Di Luca. Di Luca chased down Hoogerland and Sagan jumped ahead with 1100 metres left. A moment of respite at the top opened the door for Kreuziger to fire. Horner chased. Nibali countered and broke free at 500 metres. Sagan kept watch. He would not allow Di Luca to win, so he followed. He passed Di Luca and held off Kreuziger, who now becomes Horner’s main rival. Horner said the stage finish to Prati di Tivo suits him tomorrow. As it is, the organisers plan to keep the summit finish to 1450 metres. The stage race finishes on Tuesday with a time trial in San Benedetto. Tirreno-Adriatico is Horner’s first race back since crashing in stage eight at the Tour de France. He suffered from concussion and broken nose, and later, a collapsed lung.